I thought about starting this post with all sorts of disclaimers such as I know I haven’t been married for very long and I know I’m young. Blah, Blah, Blah, and I say phooey with disclaimers. I’m just going to share with you what I’ve discovered about marriage, and we will start with #1. The world wants to tell you that marriage is where love goes to die. They hype up the engagement season, and leave the married part in the dust. But folks, marriage isn’t boring. It’s hard work, but it’s also fun work. You learn about each other constantly. You make all sorts of jokes you’d never say in public. You share a whole lot of which nobody else knows about, and you could care less if they do. 2. Married life isn’t boring. You’ll notice that not all married couples go on and on and about each other on social media. This does not mean that they have a boring married life. I’ve gotten much more quiet since marrying Ben. I share fewer photos of us. I care less about people knowing what we are doing. In fact, I find it particularly fun to keep people in the dark about all our dates and memorable times. That’s called intimacy, and it’s the best. 3. Getting married young is not boring. I did not throw away any life experiences by getting married young. I did not “lose myself” or miss out on anything big because I got married young. Getting married young is one of the FUNNEST things I could possibly do in life. It’s crucial to be seeking God while making this kind of decision. It is a big one, but don’t mistake big for bad. And I must take another moment to say that marriage is downright FUN! 4. 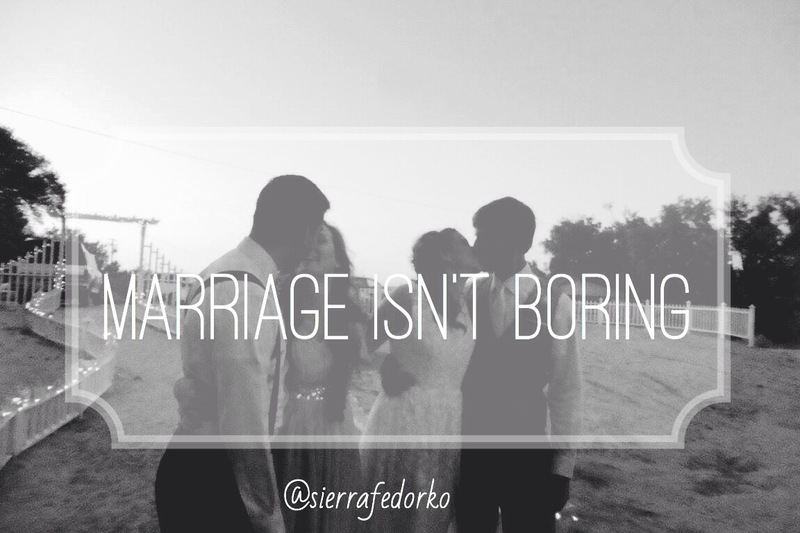 Love in marriage is not boring. It might not be as flowery as it was when we were dating. It may not come in huge presentations of magnanimous dates and gifts, but look we’re so busy living life, making the bed for each other, cracking jokes, feeding the dog, doing house projects, cleaning laundry, taking walks, picking up after each other, and forming new habits together that our love tank fills up and spills over in the most ordinary ways. Yes, of course there are still magnanimous dates and special gifts, but much more often there’s ordinary life to live alongside each other and that’s so very….FUN. Gasp! Did I just repeat myself? Umm…yes, yes I did (refer to #1 and basically the entire post). I can’t say it enough! Marriage is NOT boring! Is marriage hard work? YES. Is marriage just hard work? NO. There’s fun work too. We’ve got this nasty ho-hum stigma to marriage, but marriage isn’t boring! It’s a lot of ordinary, a lot of forgiveness, a lot of failure, a lot of grace, a lot of work, and a lot of fun (and when I say fun, I do mean fun!). Life is not an ice-cream sundae with a cherry on top, and there are some difficult days (and seasons) to marriage, but never let people tell you that marriage isn’t worth it. Never let people convince you that it’s a boring place where love goes to die. Yes, yes I’m young and I haven’t been married long, but I think this has to be shared. So folks, I’m a 22 year old wife and I’m having loads of fun! As the years go on its the little things that a spouse does that sometimes mean a lot. I’ve been married for 11 years and my husband and I are always very busy. However, we make time to go on dates and mini getaways. We have fun and often make each other laugh. I was married at a young age as well😊. As the years go on you will see changes that will happen. It is fun to “grow ” with your spouse.